Jones Lang LaSalle Morocco is currently mandated by Al Manar Development Company subsidiary of CGI - CDG, to commercialize 69,514 sq. of the first grade A office space in Morocco. Al Manar Development Company subsidiary of CGI-CDG, since its creation in 1959, the financial institution has been a strong vector or launching, promoting and animating the Moroccan real estate market. Today it is one of the main market-movers in the kingdom, as it totals about 10 billion Euros worth of managed assets. Ivory Tower3 : office tower on 9 floors with a total office surface of 7.800 sqm to be delivered end 2012. Crystal Tower2:Office tower on 14 floors with a total office surface of 17,195 sgm to be delivered December 2012. Crystal Tower3:Office tower on 9 floors with a total office surface of 11,200 sqm to be delivered December 2012. Crystal Tower1: Office tower on 12 floors with total office surface of 15.660 sqm to be deliveoffice surface of 17.195 sqm to be delivered December 2012. Ivory Tower5: Office tower on 8 floors with a total office surface of 5.900 sqm to be delivered June 2013.
International Facility Management will be implemented on the project. 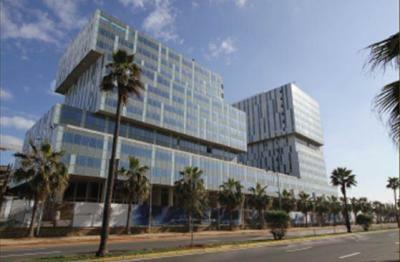 Location of project is on the waterfront and port area of the CBD of Casablanca. Easily accesible on main boulevards and a main round about which allows to U-turn on opposite directions on the same Boulevard. Lease and sale prices are extremely competitive considering the grade A premium quality and the finishings on the project. 4 lifts/on each building that contains lifts that with high turn around capacities. Technical rooms located in the centralized in a single common area on all levels. Ample parking and dedicated office spots and public visitor parking areas available. Control and sub electric counter units for electricity, AC and other utility consumption per floor. All floors on each building with fibre optic technology for the communicaiton wiring. Energy efficiency and electric cost reduction due to the façade treatment realized. Medium to large useable floor plates which are pre-fit out, spanning from 350 sqm to 2000sqm. False and raised technical floors which allow for flexibility as per the occupation needs of tenants and flexibility in cabling and electric/IP fittings needed. Modular technical false ceilings, which are not affected by a loss in the height due to cumbersome beams and which generally allows for a flexibility in the fit out without constraints. Cabling trays throughout the false celing allowing for ease of redistribution and redistribution of the lighting points in the event of partitioning is undertaken. Fire detection system and a access control system with security coverage, incorporated. Window or façcade treatment which can allow for energy efficiency that can be up to 40%. Compliance of high rise IGH regulations (compliance with regulations for high rise buildings) .